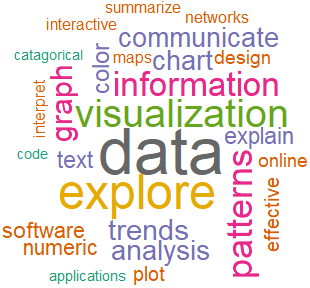 Data visualization is a topic to consider throughout a research project. Exploratory visualization can help discover patterns in the data that may not be clear from statistics alone. As this example shows, differences in underlying data with similar summary stats can be extreme! In addition to supporting a deeper understanding of data patterns, visualization is also a frequent final output of research. Putting some time and thought into data visualization upfront can help you create more effective charts, graphs, and figures. While software and data type may vary by discipline, the underlying concepts of good data visualization are consistent. This guide provides guidance on best practices and useful tools to help guide successful data visualization.